OK. So a good friend of mine teaches Math in our Middle School and we’re constantly talking about the various standardized tests that we subject our kids too (he currently has my 7th grade daughter for Intermediate Algebra). The students are taking ForeSight tests this week. Sort of a practice for the PSSA tests later in the year. This morning he texted me a math problem from the 7th grade ForeSight test and asked if I could solve it. So I solved it using simple amortization, but none of the possible answers match (or are close to) my solution. So I went online to solve it and got the same solution that I got by hand. Anyone care to take a crack at this problem – a typical example of a 7th grade standardized test math question? PS. My teacher friend couldn’t solve it either. PPS If you feel like the problem might be missing some information, welcome to the club, nevertheless, this is how the kids have to solve it. I don’t have a kid in school anymore so I’m missing out on all the fun related to Common Core and whatever ForeSight and PSSA are. I hear a lot of parents and teachers complaining about Common Core. I know Bill Gates likes it and he’s a smart guy. The complaints from parents, like the one above, seem to be mostly about testing. Most of the respondents on the office discussion board agreed that this was a terrible question but I don’t have a real problem with it. “Net worth” is used a little bit loosely as it doesn’t take into account the value of the car, but I think it’s obvious what the question is asking. I remember when my kid was taking junior high math that there was an emphasis on estimation and “ballparking” calculations. Don’t do more work than you need to. 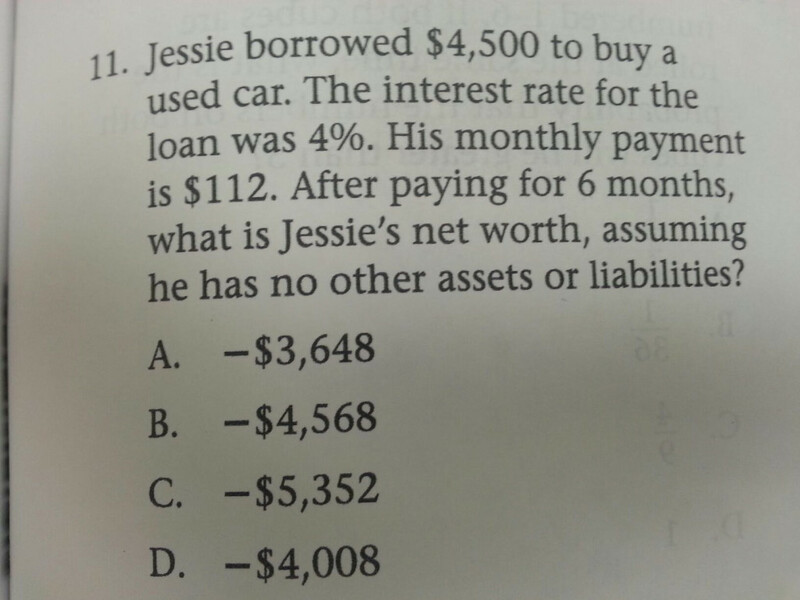 So I’d expect to see someone solve the problem like this: After making 6 payments, Jessie shouldn’t owe more than he borrowed so eliminate B and C. Answer A suggests that he’s paid down 800-something dollars, which is wrong because 6 times 112 is less than 800. So the only possible answer is D. Trying to do an amortization calculation is not the right approach to the problem. Also: Net Worth would be Assets – Liabilities. Net Worth could not be over (6*$112)-intrest. None of these answers could possibly be correct.